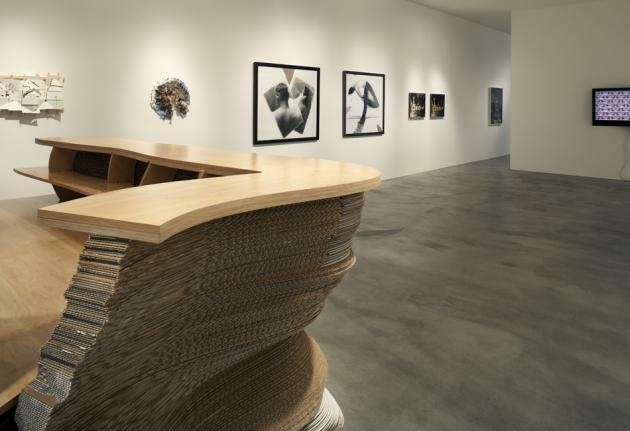 The Edward Cella Art + Architecture gallery in Los Angeles has announced the installation of a permanent sculpture-like workspace designed by Ball-Nogues Studio in its newly relocated gallery. 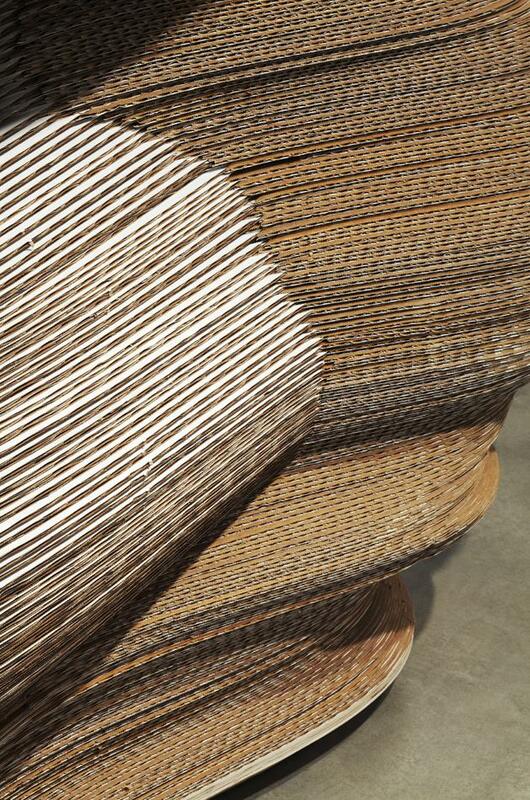 The undulating functional object was crafted from assembled layers of diecut cardboard and Koskisen plywood. Seeking to affect the white cube space of the gallery with the minimum of materials, Ball-Nogues utilized the surging repetition and pattern created with stacking two shapes of pre-cut cardboard designed and calibrated on computational software. 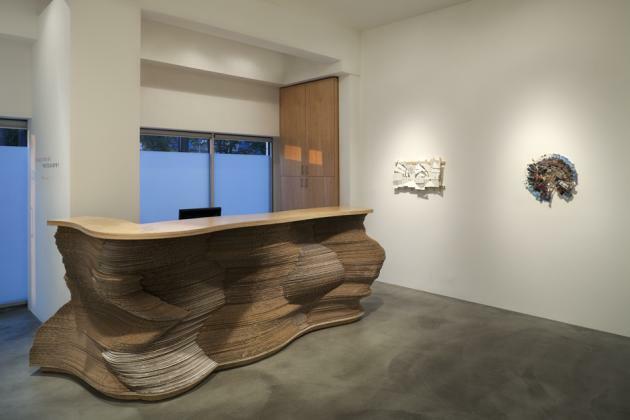 Suggesting movement and vitality, the reception counter acts as a fluid yet intermediary object between the public space of the gallery and the gallery’s workspace. 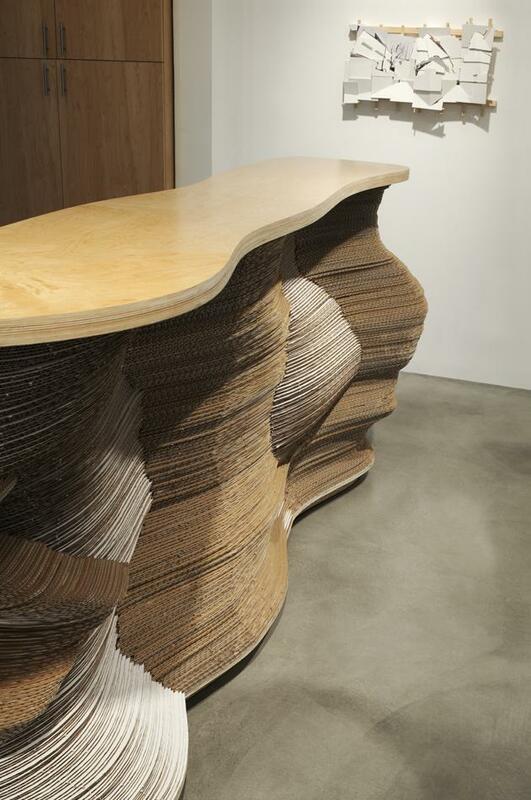 Fabricated by the architectural firm’s collective team, the workstation reflects the gallery’s emphasis on craftsmanship and execution. Embracing the post-gilded age economy, the design’s humble materials does not shy from seeking new, dynamic forms. Visit the Edward Cella Gallery website – here. Visit the Ball-Nogues Studio website – here.